At Chautauqua, opportunities for learning weren’t confined to classrooms and lecture halls. Dr. John Vincent, a Methodist minister and co-founder of the Chautauqua Institute, was a great proponent of learning in the out-of-doors. He embraced the forest setting and set out to make Chautauqua the standard for open air summer schools throughout the country and the world. One notable example of Dr. Vincent’s vision of a fresh-air classroom was Palestine Park. He came up with the concept of making a miniature model of the Holy Land so students could get a visual sense of the settings they learned about in their Bible classes. Text of the sign posted at the entrance to Palestine Park. Click on the image to see a larger version. 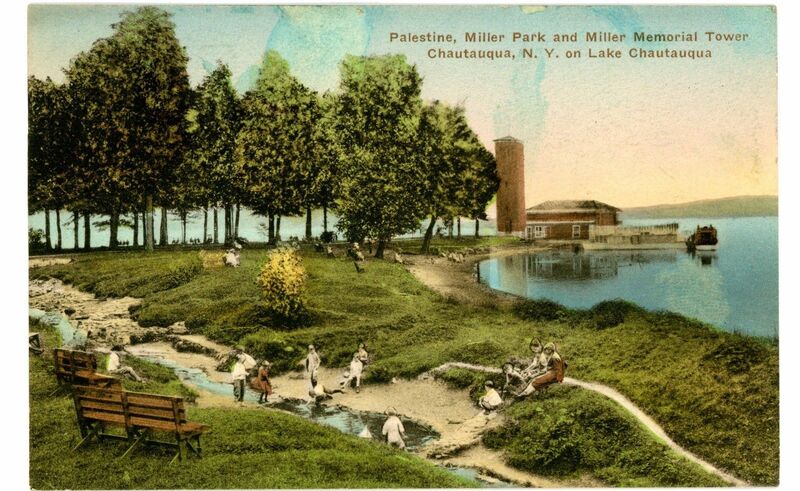 Palestine Park was constructed near the pier on the shore of Lake Chautauqua. The lake itself represented the Mediterranean Sea. Nearby were representations of the cities of the Philistines, Joppa and Caesarea, Tyre and Sidon. The Mountain Region showed the famous places of Israelite history from Beersheba to Dan. The sacred mountains Olivet and Zion, Ebal and Gerizem were built. And there were also the River Jordan, the Sea of Galilee, and the Dead Sea. Small plaques identified each place of interest and included Bible verses that mentioned the site. 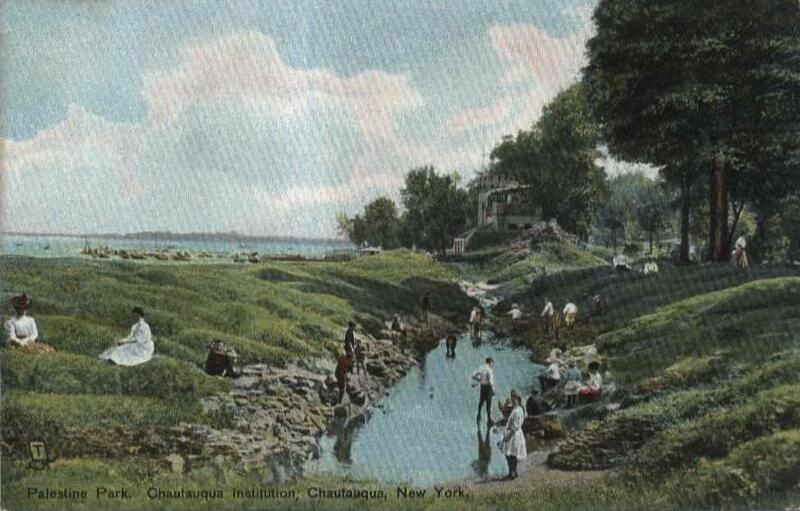 In 1920 Dr. Jesse Lyman Hurlbut published a guide to Chautauqua’s Palestine Park. Click on this cover image to read Dr. Hurlbut’s guide. 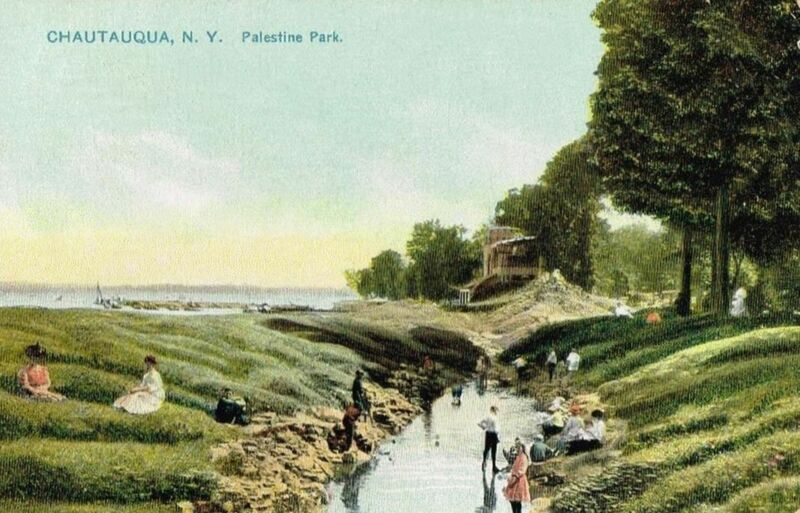 Old postcard of Chautauquans enjoying Palestine Park. 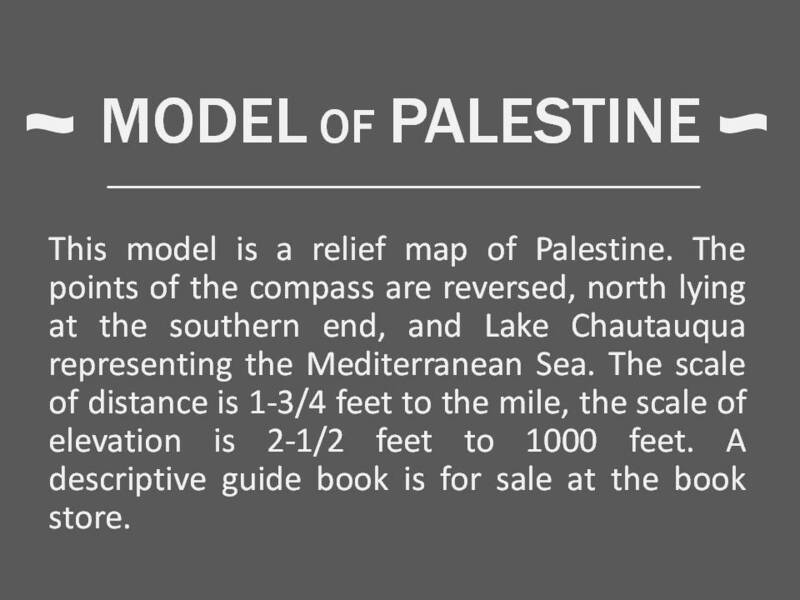 The model of Palestine was one of the most popular sites at Chautauqua. Theology students regularly walked the area of Palestine Park, notebooks in hands. And Sunday school teachers held classes there, sometimes on the hills around Nazareth to illustrate a lesson on the boyhood of Jesus. “We have been entertained, without any effort on our part,” she said. Nevertheless she suffered herself to be persuaded to go for a walk, provided Eurie would go to Palestine. There was one other person who, it transpired, would as soon take a walk as do anything else just then. He joined the girls as they turned toward the Palestine road. 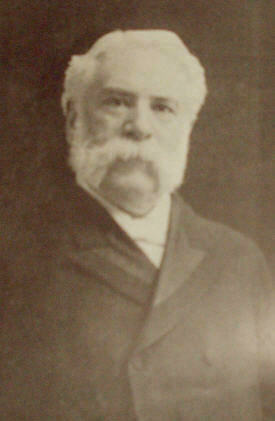 That was Mr. Evan Roberts. “Are you going to visit the Holy Land this morning, and may I be of your party?” he asked. “Yes,” Flossy answered, whether to the first question, or to both in one, she did not say. Then she introduced Eurie, and the three walked on together, discussing the morning and the meetings with zest. “Do you really think it has any practical value?” Eurie asked, skeptically. Mr. Roberts looked at her curiously. “But do you suppose it is really an accurate outline?” Eurie said, again, quoting opinions that she had read until she fancied they were her own. Again Mr. Roberts favored her with that peculiar look from under heavy eyebrows—a look half satirical, half amused. On the whole, Eurie had the satisfaction of realizing that she had appeared like a simpleton. Flossy, meantime, was wandering delightedly along the banks, stopping here and there to read the words on the little white tablets that marked the places of special interest. Mr. Roberta swung a camp-chair from his arm, planted it firmly in the ground, and drew a Bible from his pocket. “I am not very familiar with the text-book,” Eurie said. “If you are really in the village yourselves you might possibly inquire of the inhabitants before I could find the account.” But she took the chair and the Bible. “That was Jesus, wasn’t it? Then he went this way, this very road, Eurie, where you are sitting!” It was certainly very fascinating. “And stopped at the house on which you have your hand, perhaps,” Mr. Roberts said, smiling at her eager face. Eurie, Flossy, and Mr. Roberts spent the better part of the day at Palestine Park, following the plaques from one location to the next and reading verses out of Mr. Roberts’s Bible. 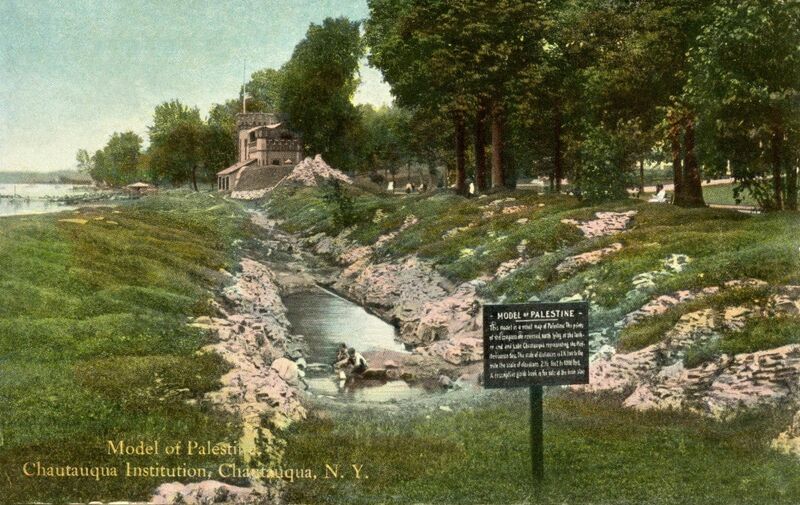 Palestine Park was among the great attractions at Chautauqua and, as Isabella mentioned in her book, it received accolades from Biblical scholars of the time because of its accuracy and geographical precision. But Palestine Park did have one major flaw, which was alluded to in the sign that marked the entrance to the model. 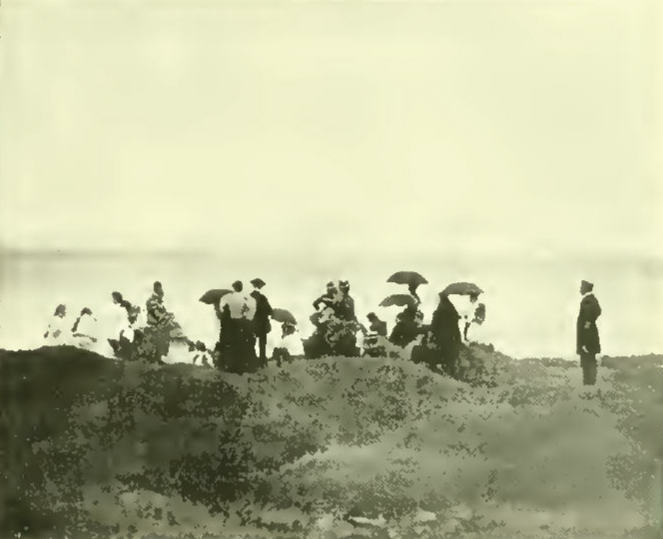 In order to use Chautauqua Lake to represent the Mediterranean Sea, the geography of the Holy Land had to be flipped; north had to be south, and east was made the west. 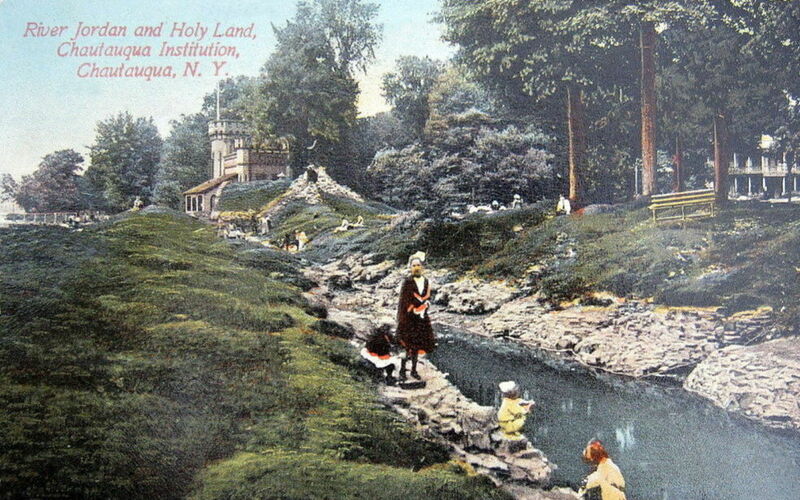 Over the years, Palestine Park was repaired, rebuilt and expanded to add a model of Jerusalem and its surrounding hills, as well as Bethlehem, Jericho, and other places of interest until, ultimately, it almost doubled in size. 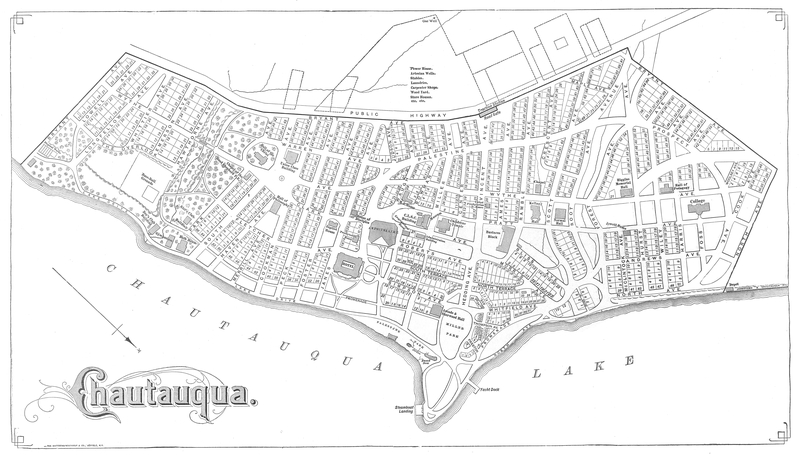 Click on the map below to see where Palestine Park was located on the Chautauqua Institution grounds. You’ll find it on the shore of Lake Chautauqua near the steamboat landing at The Point.